Use of the 12-dimensional Tree of Life. Spiritual names/gateways. This meditation will activate the 12-dimensional tree of life and its energy centers, which align your consciousness more into yourself, and will bring into activation more of your connection to your higher consciousness. The language used in the spheres is a Lyran-Sirian-Elven mixture. Pronunciation key: Oh - like in the word or, ah - like in the word heart, e -like in the word head, u - likein the word room, i, like in the word deep. ai - like in the word eye. This general way of pronouncing the words is recommended for precision, although the names do work with any pronunciation. In the middle is Akira yun - the central heart core of the tree of life. Akira - ah - infinity, ki - nexus, ra - oneness, akira - nexus between infinity and oneness, one possible translation 1. Mu El Ma. 2. Wu Yuna Yosai. 3. Or Ish Na Elumin. 4. Arun Shem. 5. Ai-Ranu-El Bana Ur. 6. Asiramiru-el. 7. IL Mani Kasira El. 8. El An Ra Min ru. 9. Enshira Kasavaru. 10. Tilasa Narumin. 11. Eliranu Ruharamin. 12. Masira Kasanu El Ahunta Min. It is a way of 'relating to' your higher self and merging with it. 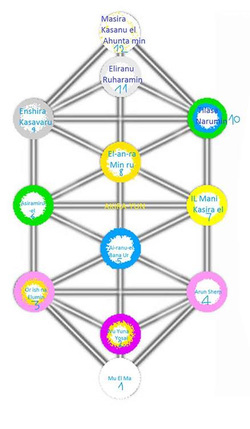 Each of the sound tones are names/gateways of specific pure angelic and archangelic and ascended timeless beings and your own higher self and higher consciousness mind and heart, that tend to the 12-dimensional tree and its active, wholesome functioning, with your participation in this, the tree of life becomes active within you. This meditation can be very long, so take your time and use good timing, make sure nothing can disturb you during this meditation, you may close all doors and pull curtains over your windows if you feel it is good, and you may also light a candle (white or otherwise) with the intention of blessing your place, your private space of meditation. You can repeat each of the steps in this medtiation as much as you want, take your time with this, it's valuable time with your higher self. The exact time of each of the steps is not important, 4-5 minutes is a general estimate for effectiveness, you can do each step for as long as you want, although it makes your time of meditation very long, which has its advantages (it centers you very deeply and alters your state of awareness very deeply and positively). You may open your eyes to read the instruction, although close your eyes when you do them. Your higher consciousness will enhance this meditation. Before beginning, connect your root chakra (at the height of your tailbone), into the core of the Earth, with a strong exhale through your nose. Do the same with your heart chakra. After this, connect your crown and third eye chakras into the central sun of existence, very far above you, beyond location and distance, do so with a sudden exhale also. 0. Take your focus onto the tip of your nose, mostly keep your eyes closed in all of this meditation where you can. Breathe 7 full deep slow breaths through your nose only, focusing on the tip of the nose and on the sensation of breathing. After this, tone or chant calmly and slowly - Akira Yunasiro Manu El Lo Mai and/or simply Akira for 4-5 minutes centered into your higher heart center above the physical heart, yet on the central vertical axis. You can intend a blue-golden-white flame there with a pink shimmer. This center corresponds to the part of your identity that is beyond manifestation, beyond the 15th dimensional structure of time and space. You are unlocking the higher heart center or Azu-Re, diving into your higher, full nature. After having toned or chanted those words, again focus on deepening your breath. In full conscious deep slow breaths through the nose, for about 4-5 minutes, with your imagination fill all of your body and cells, chakras, tree of life spheres, and all other energy centers, from the top of the head to your feet, fully with bright blue-gold-pink-white and violet-green light. As you breathe deeply, and after breathing deeply, see or intend it flowing through you, breaking down and dissolving all limitations and barriers and blockages in your aura and body. 1. We start from center number 12, which is located less than a foot above the head. It corresponds to the 12th dimension. Imagine it as a golden-white sphere of living light. It contains your 12-dimensional level of identity. While keeping your eyes closed, imagine white light with a golden shimmer flowing down your central vertical current from the 12th dimension, through your body into the core of the Earth, who then reflects this light back into your light body on her own volition. While imagining that this continues, and has been triggered by your imagination and intent, tone the sounds Masira Kasanu-EL Ahunta Min - in your 12-d center less than a foot above your head - tone with the energy flow for several minutes, slowly, you can sense or feel the energy flow continue. Bring into awareness or imagination, the quality of being your full self, the higher and the lower selves as one. In full conscious deep slow breaths through the nose, for about 4-5 minutes, with your imagination fill all of your body and cells, chakras, tree of life spheres, and all other energy centers, from the top of the head to your feet, fully with golden-white liquid light. As you breathe deeply, and after breathing deeply, see or intend it flowing through you, breaking down and dissolving all limitations and barriers and blockages in your aura and body. 2. 11th center - focus on the area an inch or more right above your third eye/pineal gland. See or intend or imagine pale silver light there, with a glimmer of aquamarine blue, all as a sphere of light with a white core. This center connects to the 11th dimension of your identity. You remain as one with your higher nature at all times, any separation is an illusion created by the thoughts and actions based on those thoughts. This energy center is a place of divine/godly discernment on the nature of your connection to the consequences of your thoughts and actions. It is also where you can easily relate to one thing becoming two or more things, and where two or more things become one thing. Gently maintain this awareness and start chanting Eliranu Ruhara Min - into the 11th center right above your pineal gland, for 4-5 minutes. Once this is done enough for you to feel a change in energies, again, in full conscious deep slow breaths through the nose, for about 4-5 minutes, with your imagination fill all of your body and cells, chakras, tree of life spheres, and all other energy centers, from the top of the head to your feet, fully with pale silver-aquamarine-blue light. As you breathe deeply, and after breathing deeply, see or intend it flowing through you, breaking down and dissolving all limitations and barriers and blockages in your aura and body. 3. 10th center - focus on the area of your left cheek bone, left side of the mid-level of your face and the left ear - within that area is the tree of life sphere corresponding to the 10th dimension of your manifested identity. It is a sphere made of blue-green white light with a golden and violet tint located in that area. The quality of this sphere in this context is the full Wisdom of your entire being, as it has experienced many, many lifetimes of diverse experiences. Holding your awareness in that area, chant Tilasa Narumin for 4-5 minutes slowly with calm, strong focus. Once this is done enough for you to feel a change in energies, again, in full conscious deep slow breaths through the nose, for about 4-5 minutes, with your imagination fill all of your body and cells, chakras, tree of life spheres, and all other energy centers, from the top of the head to your feet, fully with blue-green white light with a golden and violet tint or glimmer. As you breathe deeply, and after breathing deeply, see or intend it flowing through you, breaking down and dissolving all limitations and barriers and blockages in your aura and body. 4. 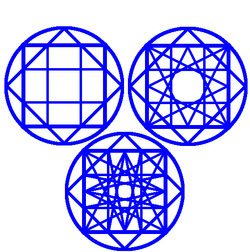 9th center - focus on the area of your right cheek bone, right side of the mid-level of your face and the right ear - within that area is the tree of life sphere corresponding to the 9th dimension of your manifested identity. It is a sphere made of silvery-white light. The quality of this sphere in this context the ability to understand everything that exists, that is experienced. Keep your awareness there and chant Enshira Kasavaru for 4-5 minutes. Once this is done enough for you to feel a change in energies, again, in full conscious deep slow breaths through the nose, for about 4-5 minutes, with your imagination fill all of your body and cells, chakras, tree of life spheres, and all other energy centers, from the top of the head to your feet, fully with silvery-white light. As you breathe deeply, and after breathing deeply, see or intend it flowing through you, breaking down and dissolving all limitations and barriers and blockages in your aura and body. 5. 8th center - focus on the area below your throat, at the lowest part of the neck, where the chest bones meet with the soft tissue of the neck. In this area is the 12-dimensional tree's 8th dimension energy center, connected to the 8th dimension of your identity. This sphere can be seen as composed of a brilliant gold light with a white core. This sphere has in this context, the quality of true knowledge, and the truth expressed as true knowledge. You know that you are infinite, you know that you are of the same identity as that which is referred to as god, and also therefore you are the same being as your higher self. Your soul and your mind are merged on this level. While maintaining this awareness or thought, focus into the golden sphere at the highest level of your chest and chant EL AN RA Min Ru for 4-5 minutes. Once this is done enough for you to feel a change in energies, again, in full conscious deep slow breaths through the nose, for about 4-5 minutes, with your imagination fill all of your body and cells, chakras, tree of life spheres, and all other energy centers, from the top of the head to your feet, fully with bright golden light with a white glimmer. As you breathe deeply, and after breathing deeply, see or intend it flowing through you, breaking down and dissolving all limitations and barriers and blockages in your aura and body. 6. 7th center - focus on the area inside from your left shoulder side, within the torso, not inside the shoulder itself, at the height of the higher heart center. It is connected to the 7th dimension of your identity. See there a bright yellow sphere with white light at its core. This sphere has the quality of illumined/enlightened loving kindness and mercy, and flow. You contain loving kindness and your nature is already inherently enlightened. You have compassion and love towards yourself and towards all beings. You are flowing through experiences and you are loved and you love and you are love. Holding that awareness or thought, for 4-5 minutes, chant IL Mani Kasira EL calmly. Once this is done enough for you to feel a change in energies, again, in full conscious deep slow breaths through the nose, for about 4-5 minutes, with your imagination fill all of your body and cells, chakras, tree of life spheres, and all other energy centers, from the top of the head to your feet, fully with bright yellow light with a white glimmer. As you breathe deeply, and after breathing deeply, see or intend it flowing through you, breaking down and dissolving all limitations and barriers and blockages in your aura and body. 7. 6th center - focus on the area from your right shoulder side, within the torso, at the height of the higher heart center. It contains a bright-green-white sphere of light. It is connected to the 6th dimension of your identity. This sphere has the quality of order, structure and strength that comes from the right use of order and higher mind's logic. You have the power to see clearly the right actions to take so that order and strength is created from the flow, and prevails. Holding that thought in awareness, chant Asiramiru EL for 4-5 minutes. Once this is done enough for you to feel a change in energies, again, in full conscious deep slow breaths through the nose, for about 4-5 minutes, with your imagination fill all of your body and cells, chakras, tree of life spheres, and all other energy centers, from the top of the head to your feet, fully with bright-green-white light. As you breathe deeply, and after breathing deeply, see or intend it flowing through you, breaking down and dissolving all limitations and barriers and blockages in your aura and body. 8. 5th center - focus on the area directly behind your navel, inside the body. There is a blue sphere with a white core. This sphere has the quality of happiness, joy, embodied serenity, beauty and balance of the emotions. You become happier when you fully embody your physical body in ways that balances and grounds your consciousness. At this level you have the choice to choose the mental and emotional state of being that you wish to experience, and it has an intelligence and logic to it that is 5-dimensional, thus it is the 'gut feeling'. Holding all that in awareness, chant Ai-Ranu-EL Bana Ur into that energy center for 4-5 minutes. Once this is done enough for you to feel a change in energies, again, in full conscious deep slow breaths through the nose, for about 4-5 minutes, with your imagination fill all of your body and cells, chakras, tree of life spheres, and all other energy centers, from the top of the head to your feet, fully with bright-blue-white light. As you breathe deeply, and after breathing deeply, see or intend it flowing through you, breaking down and dissolving all limitations and barriers and blockages in your aura and body. 9. 4th center - focus on the area inside the left hip, where the soft part and the hip bone meet. There is a sphere of pink-white light with a golden shimmer. This sphere has the quality of embodied love, of victorious alignment with your infinite nature through unconditional love, and it is therefore connected to the will of the infinite one creator. This center is connected to the 4th dimension of your identity, and to the 8th and 12th dimension and 15-th and 16th dimension of your identity holographically. While holding that thought in mind, for 4-5 minutes, chant into that center, Arun Shem. Once this is done enough for you to feel a change in energies, again, in full conscious deep slow breaths through the nose, for about 4-5 minutes, with your imagination fill all of your body and cells, chakras, tree of life spheres, and all other energy centers, from the top of the head to your feet, fully with bright-pink-white light with a golden glimmer. As you breathe deeply, and after breathing deeply, see or intend it flowing through all of you, breaking down and dissolving all limitations and barriers and blockages in your aura and body. 10. 3rd center - the area on the exact opposite side from the 4th center, inside the right hip, where the soft tissue and the hip bone meet. The color of this sphere is golden-yellow and it has a blue-pink tint to it. This sphere has the quality of free will, glory/splendor and wholesome balance between pride and humbleness. It is the sphere of the free will of the embodied consciousness. Holding that thought in mind, chant Or Ish Na Elumin, for about 4-5 minutes. Once this is done enough for you to feel a change in energies, again, in full conscious deep slow breaths through the nose, for about 4-5 minutes, with your imagination fill all of your body and cells, chakras, tree of life spheres, and all other energy centers, from the top of the head to your feet, fully with bright-golden-yellow-white light with a blue-pink glimmer. As you breathe deeply, and after breathing deeply, see or intend it flowing through all of you, breaking down and dissolving all limitations and barriers and blockages in your aura and body. 11. 2nd center - the area at the height of the genitalia, positioned at the central vertical current. There is a sphere of violet white light with a gold glimmer there. The qualities of this spheres are: the foundation to relationships with self, body, energies, and with other people and beings and with the physical and nonphysical environment and the energies of those environments. It is also the center that corresponds to the lower emotional and sexual desires, and the desires to connect with self and others energetically. It corresponds to the 2nd dimension of one's identity. Focus your awareness on that center and chant Wu Yuna Yosai for about 4-5 minutes, while holding that in mind. Once this is done enough for you to feel a change in energies, again, in full conscious deep slow breaths through the nose, for about 4-5 minutes, with your imagination fill all of your body and cells, chakras, tree of life spheres, and all other energy centers, from the top of the head to your feet, fully with bright violet-white light with a golden glimmer. As you breathe deeply, and after breathing deeply, see or intend it flowing through all of you, breaking down and dissolving all limitations and barriers and blockages in your aura and body. 12. 1st center - below the feet, on the central vertical current. There is a sphere of crystalline white light, which intersects with the black void of emptiness and the red wave band of the first dimension, and is connected to the 1st dimension of one's identity. This energy center is also directly connected with Earth's core and with Earth's own first dimension sphere of her own 12-tree. This sphere has the quality of sovereignty or self-rule upon one's own individual reality and the experience of it at the most fundamental manifested level. Holding this thought in mind, chant into this sphere of white light Mu EL Ma for about 4-5 minutes. Once this is done enough for you to feel a change in energies, again, in full conscious deep slow breaths through the nose, for about 4-5 minutes, with your imagination fill all of your body and cells, chakras, tree of life spheres, and all other energy centers, from the top of the head to your feet, fully with bright clear crystalline white light. As you breathe deeply, and after breathing deeply, see or intend it flowing through all of you, breaking down and dissolving all limitations and barriers and blockages in your aura and body. Consistently breathe through your cells and atoms and imagine them lighting up with immutably pure light and staying active (visualization and intention both work for cellular and atomic charging). Imagine immutable pure light sealing your aura completely, in both versions. Use before and/or after version 1 and version 2: Imagine a bright sphere or sparkle of immutably pure blue-green-golden-silvery-white plasma in your third eye, exhale it into the core of the Earth, you can sense or imagine a reaction from Earth core into your aura and chakras. Inhale the same colored light from Earth core into your aura, fully activating a pillar of immutably pure plasma between Earth core and your aura. Extend this pillar into the core of your 14th chakra high above you with a strong breath. Version 1: Breathe very slowly in through the nose, and out through the mouth 7 times, with the exhale having the mouth in ah position and the 7 exhales being longer than the 7 inhales. Immediately after that, breathe very slowly through the nose only, 7 times (you may hold the tongue in contact with the top part of the mouth in step 2 and the corresponding steps in version 2). Version 2: Choose an amount of breaths for each of the following steps that is at least 7, or above 13. For example: 1. Very slowly breathe 7 times through the nose, 2. 7 times in through nose out through mouth and 3. 7 times through the mouth only, and then do step 2 of this version 2, and then step 1, and then step 2, step 3, and 2, 1, on and on, for as long as you like. Imagine a bright sphere or sparkle of immutably pure blue-green-golden-silvery-white plasma in your third eye, exhale it into the core of the Earth, you can sense or imagine a reaction from Earth core into your aura and chakras. Inhale the same colored light from Earth core into your aura, fully activating a pillar between Earth core and your aura. Extend this pillar into the core of your 14th chakra high above you. You can do any of the versions here, with each step 18 or 36 slow breaths or even more, like 45, or 54, 64, or 72, or 128, or 144 or 145, as long as you use equal amounts in each steps, the vortex generated will be highly effective. One of the many possible effects of this technique may be partial or full optical invisibility of your physical body and undetectability in dimensional levels. Each breath corresponds to one full frequency band or dimension of energy unlocked, the difference that takes place between the steps 1 and 2 of version 1 (and the corresponding steps in version 2), are such that an effective hyperspace vortex is generated each time, although the hyperspace vortexes are generated each new step transition. This breathing technique is an example of the simplicity of breathing, and the power of it, which is discernible through its effects. The applications of this breathing technique are many, and it can be used in combination with other attributes of meditation. Light body activation mantras - repeat several times for effect. The mantra written in magenta is for the activation of the higher heart center. KUMANNASIRON KAI PU PA - produces monoatomic elements (pure non-degraded,non-degradable versions) into physical and other bodies. rahunta kai pu pa - 12-15-18d.